The MCU has been consistently been getting better as the phases go by. Captain America 2 was better than 1 and 3 was better than 2. Thor 2 was better than 1 and now this latest Thor film has arrived and is the best film in the trilogy. It’s a very fast paced film with a lot of action and hype throughout. It also does a great job of showing how great of a fighter Thor is with or without his hammer. It’s going to be hard for the next Thor film to top this one. The film starts off with Thor seemingly being held captive by Surtur. Of course, the whole thing is basically just a ruse to get information. That shouldn’t come as much of a surprise since think we all found it highly unlikely that Thor can be bound by mere chains. Unfortunately Thor has not stopped Ragnarok by defeating Surtur as the true source of despair shows up. Hela is the goddess of death and her abilities are the real deal as she easily beats Thor and Loki. Thor is going to have to form his own team to defeat her. The heroes definitely get around in this film as Thor goes to Earth, Surtur’s Domain, Asgard, and the Grandmaster’s planet. It’s fun to see all of the different locales as they all worked quite well. The weakest one design-wise would be Grand Master’s HQ, but the arena looked quite good. Earth may win out since it was great to have a Dr.Strange cameo. He looked really good in that scene and they’re definitely building him up to be one of the team’s power hitters. He’s also one of my favorite Avengers in the MCU so I’m ready to see him get more of a role. He’ll have to keep his list handy since a lot of threats are certainly coming to Earth in the near future. Thor has a lot of fun in this film as he openly mocks the villains and just tries to enjoy everything he does. He’s a good lead and this is probably the best that he’s been portrayed. He’s a lot wiser than he used to be while still keeping his strength. This is Thor as a leader in addition to being a warrior and it makes him a more complete character. Seeing him fight off an army at the end without his hammer was definitely impressive. It’ll be very hard for me to get used to his new hairstyle though. I’m going to miss the old one until it grows back, but it’s not the worst redesign I’ve seen as it’s still miles above the Joker. Going back to Thor having fun though, it keeps showing how Marvel is just good at writing comedy. The Iron-Man films have always been pretty fun as the humor is just handled well and this film does a great job with it as well. It’s not forced and most of the jokes land. The only film I can think of in the MCU that failed at being even remotely funny was Guardians of the Galaxy 2. Age of Ultron could be really forced at times, but it was still entertaining, it would just throw you out of the movie for a second. As DC is trying to emulate Marvel with their current movies, hopefully they’ve been taking notes. Wonder Woman wasn’t funny and Justice League’s jokes don’t really seem to be working, but it’s possible they’ll turn it around in the film or by the sequel. It takes time to be funny and writing jokes has always been the hardest part of developing a script if you ask me. That’s why it’s not really a problem as long as the jokes aren’t downright terrible, but if there are a bunch in the movie, then you want them to be good. Again, Thor: Ragnarok did a really good job with this. Loki was a fun ally to have around. Naturally you can’t trust him at all and the film’s pretty self aware on that, but at least it meant Thor didn’t have to be alone the whole time. It’s always good to have at least one companion on a journey. He didn’t look quite as impressive as usual though since everyone he meets ends up beating him up quite badly. He really took his lumps in this film but always manages to keep his confidence. I’d really be on board with him finally being an ally, not a hero as that’ll never happen, but someone who helps out once in a while and doesn’t try to destroy the world. Now I’ve never been the biggest Hulk fan. He’s a decently good character and all, but I typically just like him in his more intelligent depictions. The only exceptions are some of the really old Stan Lee era comics where he was pretty sympathetic. The film has a good portrayal of him. He’s not too annoying or anything and can put up a good fight. The writer seems to definitely know who he thinks is the stronger fighter (Thor or Hulk) and I tend to agree with him. Brute strength is great and all, but when you’re about as strong and have a variety of other techniques at your disposal, it’s game set and match. Surprisingly the film gives Hulk a backseat role for the entire climax as he doesn’t get to face off against Hela or anything, but it’s a good way to ensure he doesn’t steal the show or get humiliated in front of his fans. It was not what I expected from his role, but it worked well enough. Unfortunately, this is probably Bruce Banner’s worst portrayal. He’s really slow on the uptake and panics about everything. He is constantly in a state of shock and just holding everyone back. You almost can’t help but wish for the Hulk to return and maybe this is why Hulk wants to stay out 24/7. It’s also interesting how each side can’t remember anything after they turn so for Bruce it’s like 2 years passed in an instant. That’s actually pretty tragic so I should feel more sympathetic for Bruce…but I don’t. I miss his self assured/over confident version from the first Avengers film. I will always look to that as the definitive Bruce Banner portrayal. The only other one that’s close is from the Indestructible Hulk mini series. Valkyrie is the main heroine of the film and fulfills the role pretty well. She actually doesn’t get on board with the heroes until near the end of the film so her role isn’t huge or anything but she’s pretty tough. Balancing fighting and drinking is tough but she manages to pull it off. I can’t say that I was a huge fan of hers since her backstory basically involves being a traitor and turning evil. You’re sort of supposed to look past all of that, but it’s a little tricky and I think she would have worked better as a villain like Loki who occasionally helps the heroes. I give the film major props for not going for a romance angle here though. I’m sure the writers were pressured by Hollywood into doing this, but they refused. Heimdall has his own filler subplot where he beats up a bunch of minions and helps guard the Asgardian survivors. He’s a good character even if he doesn’t get much of a role here. He’s the kind of character who makes more of an impact if you’ve seen the first two films. Since this is the 3rd one, there’s no excuse not too. I miss his classic armor, but his new Bishop redesign works quite well and he lasted quite a while considering how outnumbered he was. Hela is the main villain and also the best character of the film. She’s a great villain because her goal isn’t crazy or just evil. It’s a pretty rational goal as taking over the multiverse makes sense to prove your supremacy. I can get behind that and I can also buy into her taking over Asgard since it is hers by birthright. She looks extremely impressive in all of her fights. I would have liked a longer round 1 fight with Thor and Loki but seeing them fight while on the light speed tunnel was certainly entertaining. I’m also glad that Thor didn’t back up when they all started hyping her up. As long as you stay on Hela’s good side you’re okay since she doesn’t seem to be in the habit of randomly destroying her minions for no reason. She may very well be the best villain in the whole Marvel Cinematic Universe at this point although I’m expecting big things from Thanos. Scourge is her right hand man and he gets his own emotional character arc. He starts off as the guy that everyone pushes around and eventually levels up to janitor. I liked him well enough at the beginning I guess, but he’s just not my kind of character. He’s one of the weak links, but his actual scenes aren’t bad so it’s not like he hurts the film. I just didn’t care enough about him to be sympathetic. Surtur appears for a bit and gets his own fight scene, but he’s definitely not as impressive as he was in the comics. Everyone basically uses him the whole time and I have to wonder what his ultimate plan is. He better appear in Thor 4 or I’m going to have to remember him as the villain to have the worst plan in the MCU. He may not have thought it over very carefully. The Grandmaster was interesting and way better than the Collector. It helps that his actor makes the character pretty entertaining as opposed to simply being quirky. There’s a big difference between the two and you always want to be the former as opposed to the latter. He’s definitely a villain through and through but tries to hide his evil intent through jokes. Hey, if Spiderman can do it for the heroes, why not have a villain with that gimmick as well? It does make sense after all and he was a fun guy to have around. I wouldn’t mind seeing him again. Korg is one of the quirky supporting characters from the Arena. While I didn’t find his voice quite as hilarious as the theater seemed too (They laughed at just about every one of his lines) it did work pretty well for the character. It’s been a while since we got a very to the point character who speaks softly but always manages to keep everyone in check. Definitely the best portrayal of Korg in all of Marvel. Stan (The Man) Lee also shows up to clean shop. His cameo may be quick, but he really sets the tone in his appearance and also shows that he fears no one. You have to have nerves of steel to have his job after all. Ragnarok’s soundtrack is absolutely great. The themes are all very sci-fi and fast paced. They help to amplify the fight scenes and make the whole film better. Good music helps make a scene more memorable so as you would expect it also has the same effect on the movie as a whole. Most films don’t insert a big song when a fight scene starts. It’s a popular trope in anime but that’s about it despite this being a fantastic way of building up energy for the scene. Well, Thor pulls it off for both the first and last fight. The last fight in particular is handled extremely well as Thor gets one last vision of a certain character and then unlocks his true power. Aside from maybe Avengers and even that is close, Thor definitely has the best soundtrack in the MCU and is high up there for all of Marvel’s theater films. The action and effects are certainly on point. The monsters of the fire world certainly looked very impressive and it made for a very good opening fight. Surtur’s design was modernized for the new age and while he was rather skinny I still liked it well enough. Hela’s fight scenes were solid as well and her costume was very faithful to the comics. Thor’s style of combat with his electricity will remind you a lot of Cole McGrath or Starkiller and it’s certainly the most efficient way to fight. When you’re using electricity to enhance your range and strength, it is very hard to dodge or counter that. Now that Thor can fight at this level the only Avenger who can reasonably give him a good fight would be Dr. Strange. I don’t think the others could keep up. Naturally the film has a scene after the credits so make sure you stick around. There are 2 scenes, but the first one is really the only one you need to worry about. It’s easily one of the best post movie scenes in the MCU as we finally have a significant plot development here which works as a great tease for Infinity War. It’s hard to imagine that the big crossover film is so close, but it is certainly approaching fast. It’s also why it makes sense to beef up the Avengers roster since they’re going to need all the help they can get. I’m not sure how some of the street level fighters will be useful, but maybe they can at least distract the villains with one liners while the real fighters take them down. Now, there is a little plot hax at the end. It’s nothing major but the final fight’s outcome should have been reversed. On one side we have a giant opponent who is extremely slow and can only attack in a straight line. On the other we have a very nimble fighter who can move quite fast and also has a lot of durability. All the character needed to do was move just a little bit and that would have worked as a dodge. I mean, the planet may not be too stable so surviving some intense energy would still have to happen, but I think the character could pull it off. At the very least, losing due to ring out would have been preferable. I’m trying to keep this review spoiler free so I’ll keep that part vague. I’d like to say that I’ve covered everything, but with a film this big there will always be something that I’ve missed. As far as the MCU films go, It’s easily top 5. Avengers is better and I’ll also give Civil War the edge but this very well could be the third best film. Age of Ultron gives it a run for its money, but I dare say that Thor beats both Winter Soldier and Spider-Man Homecoming. Either way, it confirms that Thor is certainly top 5 and we’ll see how long it can stay there if Marvel keeps raising the bar. I’m still hoping they go all out with Infinity War and have just about everyone appear. Bring in the old villains, Agents of Shield, even throw the Netflix crew a bone with a portrait on the wall or some kind of cameo. Make this the big event that it should be. Overall, The film was just about perfect. There’s not much to really say about the film in the negatives department. It did pretty well with keeping the power levels consistent. Not perfect, but basically no film is. I felt bad for the poor dragon who fought Thor, but at least the film didn’t destroy Fenfir as in my head canon he can certainly survive a fall. That was nice. Thor himself has also come a long way since the older films and makes a few speeches about what it means to be a hero. The action scenes are first rate and the graphics are quite good. The film’s also just a lot of fun the whole time and has a ton of replay value. It’s not everyday that you get a film as satisfying as this one. I teetered between an 8 or a 9 for this film for a while, but at the end of the day I think it definitely earns the extra star. 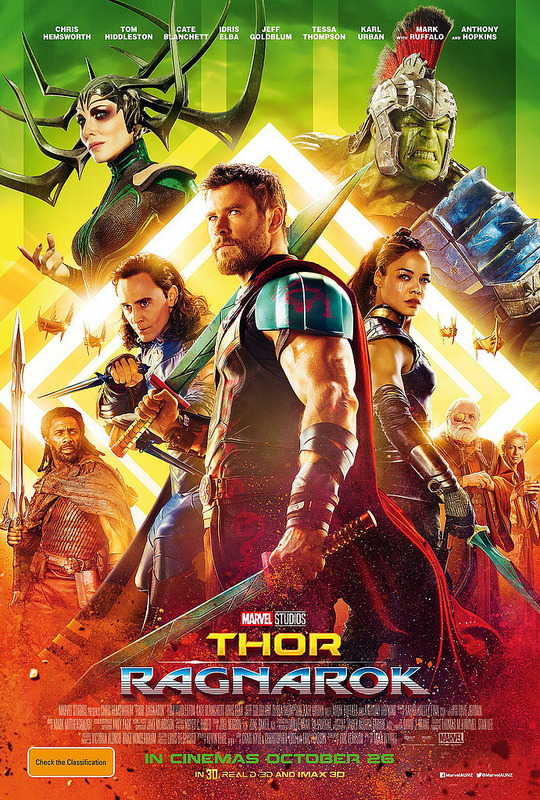 This entry was posted in Live Action Movie Reviews, Live Action Movies, Reviews and tagged Action, CBM, Chris Hemsworth, Comic Book Movie, Film Review, Hela, Hulk, Loki, Marvel, Marvel comics, Marvel Review, Movie Review, Review, Surtur, Thor, Thriller by dreager1. Bookmark the permalink. Excellent review for an excellent movie! Thor looked amazing and I was pleased with the obvious result in his battle with Hulk this time. The musical homage to Willy Wonka was cool. you are right – the music was so on point. Truth be told, I was hooked when I saw the very first trailer. Immigrant song is perfect for Thor. This is Thor’s best portrayal thus far.